Today is City Council’s last session. It isn’t lost on us that City Council plans to end its year without giving our children a guarantee about school funding. The good news is that the activism of parents and community members on the ground has sent a clear signal all the way to the governor’s office to do more for Philadelphia. The bad news is that they still want to play political games, making all funding conditional on exorbitant givebacks from the teachers’ union. Moreover, we still don’t have a guarantee on essential services and programs – sports, arts, music – even if money is restored. That’s why parents are showing up today at City Council to send a clear message about funding our schools responsibly and with a guarantee of what we’re getting for our tax dollars. Frankly we don’t trust the District to make the right decisions on prioritizing our children’s needs. And we definitely don’t trust Harrisburg to do anything more than the wretched gamesmanship expressed in their partnership with highly funded lobbying groups who have never had our children’s interest at heart. Take a moment today and make a phone call to our elected officials. 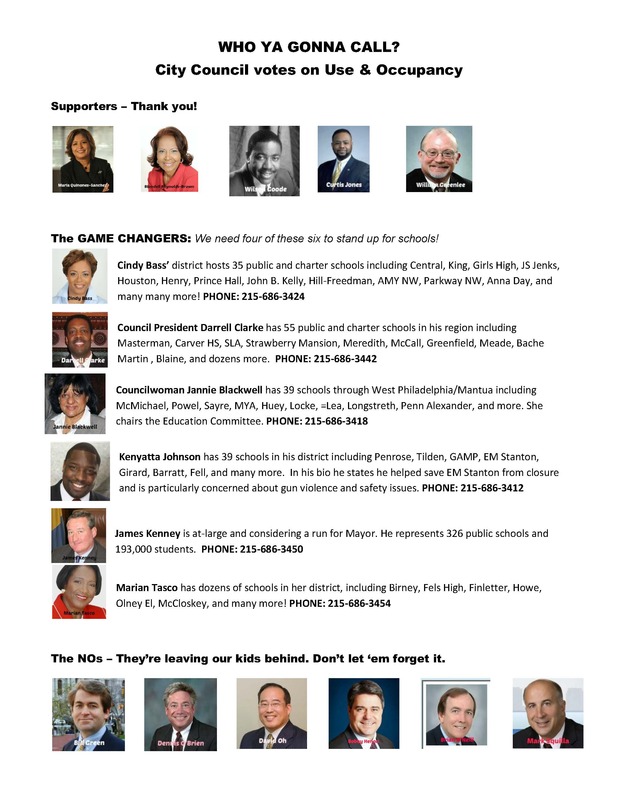 Let them know public schools in Philadelphia matter and that YOU are an education voter. And if you have time, give an hour of your day to support the more than 40 people who are testifying today about why our schools matter. Thurs., June 20, 11 a.m.-2 p.m. They would not let those of us who were signed up speak, in City Council today. At first they would not let us in and when we told the media what was going on, they finally did. When we went in, The Council President closed the testimony time saying that people were repeating themselves in their testimonies. We left very frustrated and told the media what had just happened. They did not air that part of our story.